Magic Bullet 17 piece set only $39.99 SHIPPED! 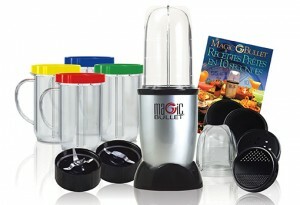 If you’ve been wanting to check out the Magic Bullet, 1SaleADay has an AWESOME deal today! Get this Magic Bullet 17 piece set for just $39.99 shipped! That’s $10 less than you’ll find it at Walmart or on Amazon and $30 off the retail price! I’ve been checking this out for awhile now (yes, I’m a bit of an infomercial junkie) and this is the best price I’ve EVER seen for this! While you’re there, make sure you also check out their flash sale on cameras! You’ll find great deals on brands like Canon, Kodak, and Nikon! In just ten seconds, whip up your favorite meals and snacks like magic! The Magic Bullet set is fast, efficient, and convenient. Simply press down on the jar and watch it do all the work for you, with no buttons to push. The two stainless steel blades are easy to clean, and they work with the high-torque base to slice, dice, grind, blend, mix, whip, and mince. The Magic Bullet replaces a food processor, blender, and coffee grinder, all while taking up a minimal amount of space! Each blender container is removable and includes a lid, so that you can easily take your food with you while on-the-go. Microwave and freezer-safe, you can keep your food hot or cold. This set includes a tall cup, short cup, four 22oz. mugs, lids, a power base with two stainless steel blades, and a 100-page recipe book. Blender jar capacity: 16 oz. 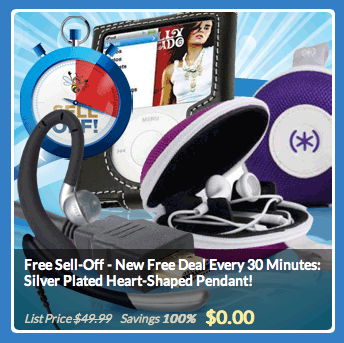 1SaleADay FREE sell-off: a new freebie every 30 minutes! Hurry over to 1SaleADay for their FREE Sell-Off! They’ve got a NEW free deal every 30 minutes and they include free shipping, too! These deals are understandably selling out very quickly, so be ready to grab the latest freebie as it changes over! Click on the link above and then click on the “Wireless” tab at the top to check out the latest freebie offer! It looks like this will be going on all day! Let me know if you get anything fun! WOW! 1SaleADay is having a Cuisinart flash sale today! Save up to 78% on Cuisinart appliances! They’ve got waffle makers, blenders, grills, ice cream makers, and more! This sale is available today only and you get free shipping on all items! Kodak Easyshare Camera for $49.99 shipped! 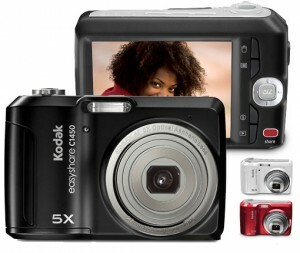 Looking for a deal on a point and shoot digital camera? Get this Kodak Easyshare Camera for just $49.99 shipped! This is great for tweens and you can’t beat this price! This camera retails for $149.99, so you’re saving $100! From dinner parties to dance parties, big things are happening in your world. With the Kodak Easy Share Camera, you can capture and share all your hottest moments with just a touch of a button. Taking beautiful pictures, more often, automatically, is what this camera is all about. Simply press to impress! Once you’ve got that amazing shot, you’ll love sharing it to your favorite places. Press Kodak’s “Share” button to e-mail it to friends or upload it to the Kodak Gallery, Facebook, Twitter, YouTube, Flickr, and other popular sharing sites.